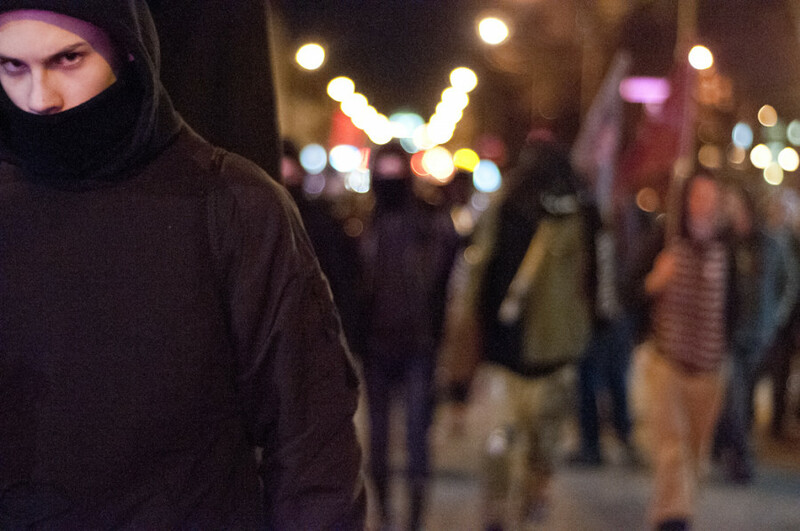 Anti-austerity protesters took to the streets of downtown Montreal Saturday night without any interference from police. The gathering of roughly 150 demonstrators marched for about two hours in the absence of any riot police trying to block their path. Police maintained a hands-off approach throughout the event, with only a half-dozen officers following the march on bikes, and a few patrol vehicles nearby. Police adopted this passive stance despite the fact that no itinerary for the march was provided beforehand, and many protesters covered their faces—factors that police have used to shut down marches in the past. Police made only one announcement over loudspeaker throughout the entire demonstration, asking protesters not to march against oncoming traffic. 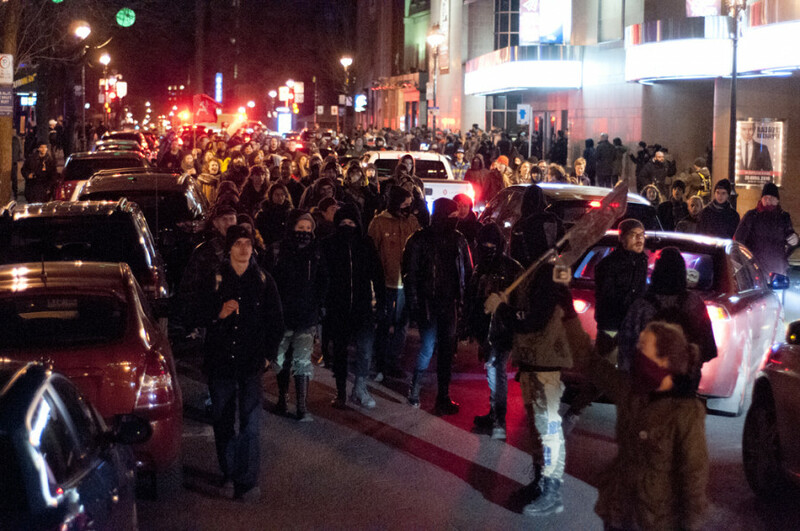 No arrests were made over the course of the evening, and no fines were handed to protesters. The group met at Phillips Square and began marching at 8:30 p.m., heading east on Ste. Catherine St. until Berri metro station. 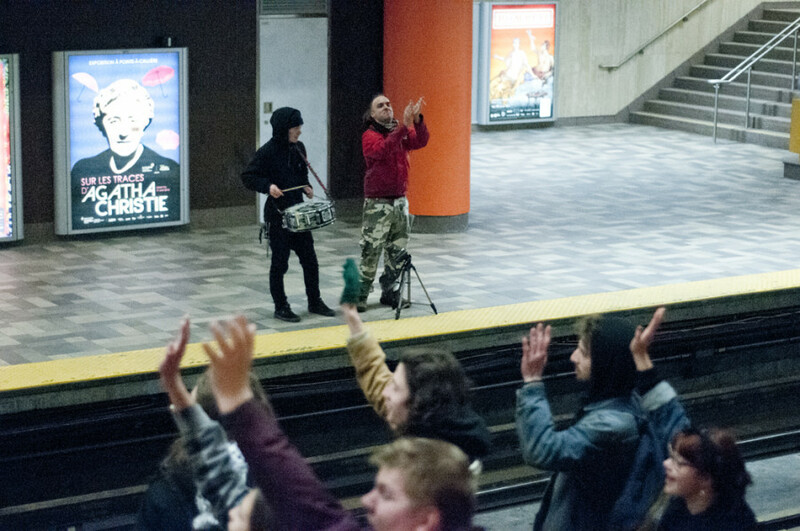 After nearly two hours of marching, protesters made a surprise turn into the entrance of McGill metro station, and got on a metro car back to Berri station. As the group disembarked the train and climbed Berri station’s stairs toward the exit, a couple of protesters were seen quickly placing unknown items into garbage bins. A spokesperson for the Montreal police told The Link that some small fires were started in the garbage bins, but they were quickly neutralized. The police spokesperson also confirmed that a physical altercation took place between a protester and a bystander while the group was in the metro system. The encounter apparently left the bystander with injuries to his face, which were treated at a hospital. This demonstration came in the wake of the annual anti-police brutality protest on March 15, which also saw a relatively subdued police response and no arrests or fines—a first in many years. The Service de police de la Ville de Montréal recent approach to policing protests has been a departure from the strategy usually employed, which includes riot police formations blocking street access, and the use of tear gas to disperse crowds.